Enhancing confidence, skills and knowledge. Our INSET can be site based or advertised residential courses. Participants will leave the INSET feeling inspired and equipped with new ideas and skill to deliver storytelling workshop activities. 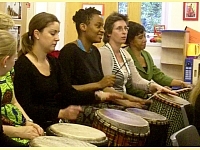 IROKO also offers Stress Busting and Team Building sessions for teachers and educational staff.